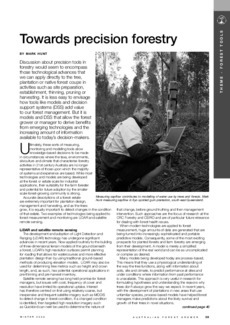 Discussion about precision tools in forestry would seem to encompass those technological advances that we can apply directly to the tree, plantation or native forest coupe in activities such as site preparation, establishment, thinning, pruning or harvesting. It is less easy to envisage how tools like models and decision support systems (DSS) add value to our forest management. But it is models and DSS that allow the forest grower or manager to derive benefits from emerging technologies and the increasing amount of information available to today’s decision-makers.